SB: When did you first start podcasting your show “The Art of Storytelling”? BW: I started that podcast in April of 2007. SB: And you’ve done over a hundred, haven’t you? BW: There are 103 online, with 17 more waiting to be uploaded. SB: And is it mostly an American audience? BW: I view the podcast as an International project. 44% of my audience is overseas. I’ve been working really hard to connect with international potential audience when they’re in the United States. The Art of Storytelling with Brother Wolf show on an Ipod with storytelling techniques for teaching storytelling creating a complete storytelling education. 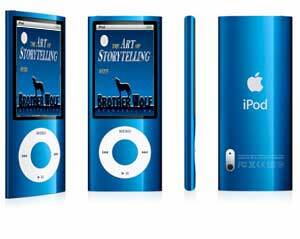 Press Play to hear Eric Wolf speak how you can support the Art of Storytelling with Brother Wolf. For more details on the Ipod Click Here. The Art of Storytelling with Brother Wolf is an internationally recognized podcast listened to in 142 countries worldwide with over 50,000 total lifetime downloads, 13,000 distinct listeners, and 8,000+ downloads in the last thirty days. With over 88+ storytellers interviewed on the show this website is rapidly becoming the worlds premiere source for teaching storytelling online. Through this encyclopedia of storytelling techniques a listener can improve their communication skills and get a complete storytelling education. Heather Forest, Elizabeth Ellis, Judith Black, Jay O’Callahan, Andy Offutt Irwin, and many other storytellers are interviewed on how to use storytelling techniques in performing for and teaching storytelling to children. The Art of Storytelling with Brother Wolf has draw guests from all over the world and created an amazing storytelling education resource of storytelling techniques that is unmatched on the World Wide Web. All episodes available right now online for immediate listening and download in the commercial lower quality version for easier down load. Individuals wishing to pre-purchase this commercial free ipod can pay $338.55 till July 27th. On July 27th the price for a preloaded ipod with 85 shows will increase too $394.65. The Apple Ipod allows listeners to scan easily to any point in each of the 85 hour long shows. Eric Wolf is the host and producer of the Art of Storytelling with Brother Wolf show witch is dedicated to supporting the teaching storytelling worldwide by providing access to storytelling techniques and a grounded storytelling education for anyone. If you’re a storyteller with a webcam, you can record your stories and post them on-line. It’s remarkably easy. Since July I have been busily recording stories and songs, making up for years of talking myself out of it because of the expense, the time commitment and my nervousness in front of the camera. Now the videographer is me, the venue is my own home, and telling to the webcam is as natural telling in front of a mirror.